Let us state here unequivocally that nothing could be farther from the truth. The current Polish and Hungarian governments were elected by significant majorities in free and fair elections, recognized as such by the international community, and they enjoy broad public support. That they are politically conservative may not be to Clinton’s or others’ taste, but this in no way diminishes their essentially democratic attributes or their standing in the international community as free and sovereign, just as the popularly elected socialist governments that preceded them. to acknowledge, was the brave resistance of the Polish and Hungarian people themselves. 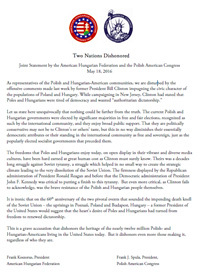 the United States would suggest that the heart’s desire of Poles and Hungarians had turned from freedom to renewed dictatorship. This is a grave accusation that dishonors the heritage of the nearly twelve million Polish- and Hungarian-Americans living in the United States today. But it dishonors even more those making it, regardless of who they are.